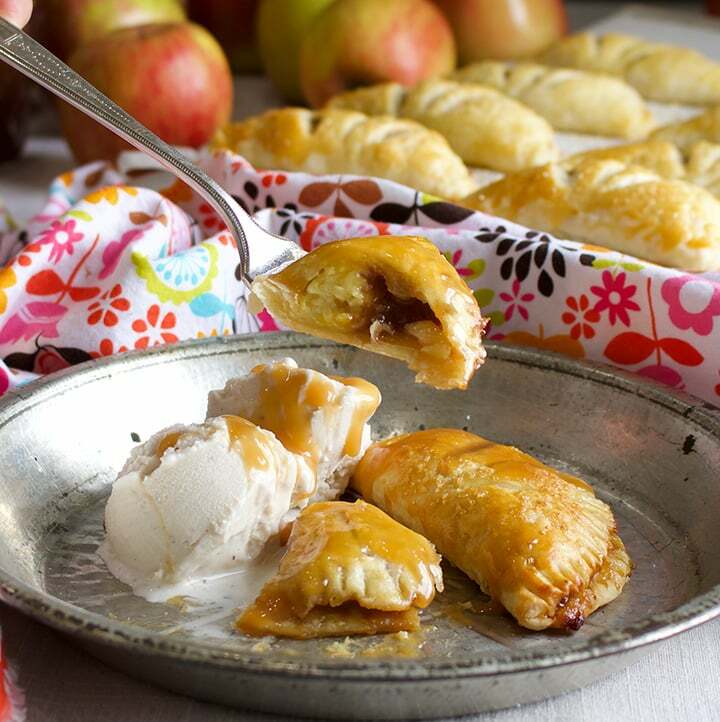 Flaky pastry envelopes vanilla almond pastry cream, apple butter, and a fresh apple slice, to make individual hand pies that are flaky, creamy, and sweetly flavored with apple and spice. There’s something about small, individual sized treats that I adore. 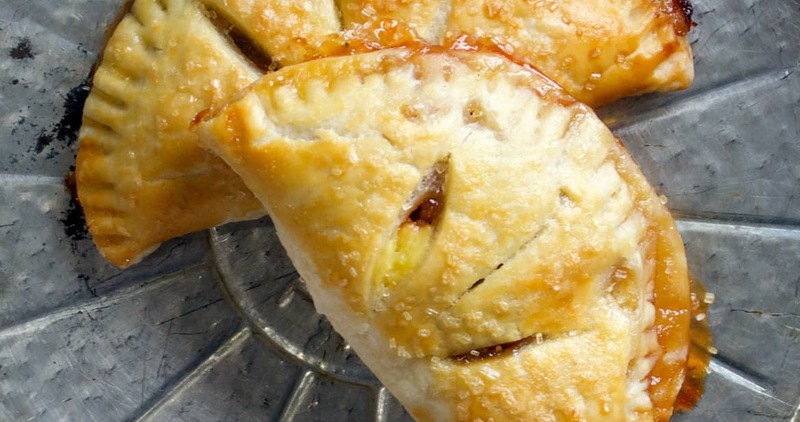 I like them so much, in fact, that I had to create a whole category of mini treats in the recipe archives on this blog, to which these little apple butter and cream hand pies are the latest addition. So, let’s start by saying that I got a bit carried away this season making No Peel Slow Cooker Apple Butter. We have kind of a lot of the stuff in our pantry. Although, perhaps not enough now that I’ve made these little pies. Because, I’m telling you, these are going to get made a lot around here from now on. They are, in my opinion, the perfect little sweet treat because: a.) they are not too sweet, b.) 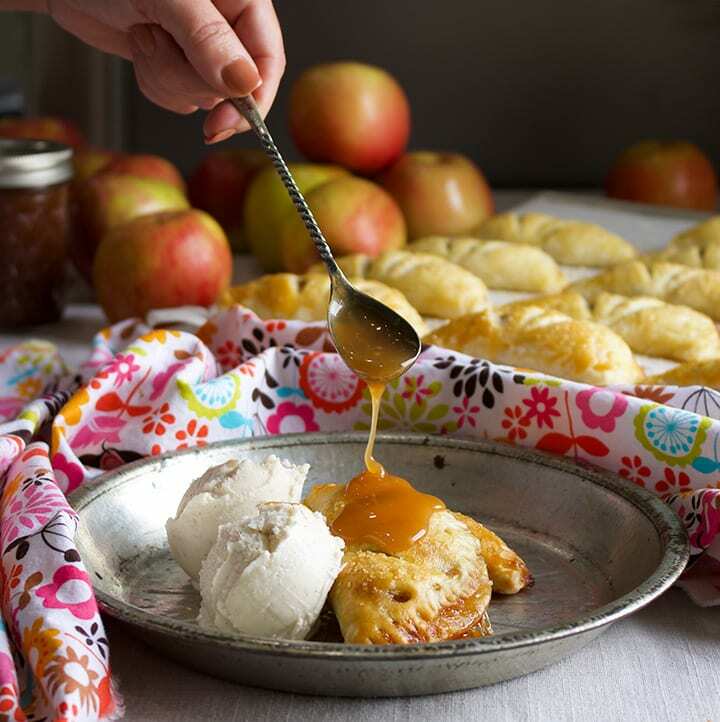 one recipe makes enough to feed a small crowd (or 2 hungry teenagers), c.) flaky pastry, spiced apples and pastry cream, oh my, d.) they make a delicious on-the-go hand-held breakfast, lunchbox treat, afternoon snack, e.) they can be easily dressed up with scoops of vanilla ice cream and a drizzle of caramel sauce. 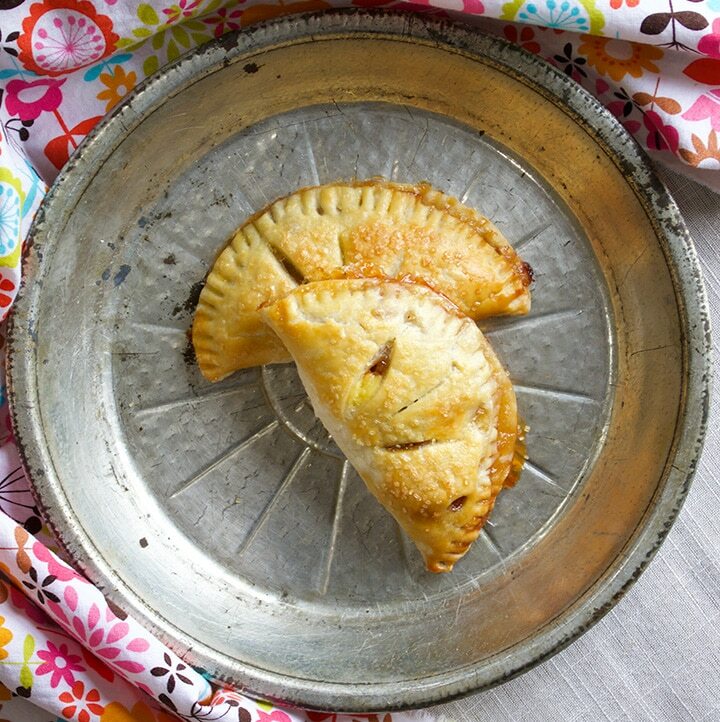 I recently made this pastry dough for ham and cheese hand pies on my other blog, A Little and A Lot. (Recipe for those little gems coming soon.) It’s a very wet dough and contains an entire half cup of sour cream. I was as skeptical as you about adding sour cream to pastry dough when I first started playing around with it. But, I’d read that it can create an exceptionally flaky and easy to work with dough, so I decided to give it a go. Friends, it’s now the only dough I’m ever going to use for this kind of thing. When you’re making it, you’ll think the dough is too wet and be tempted to add more flour. Restrain yourself. Just wrap it up and put it in the refrigerator for at least an hour so that it’s very cold. When rolling it out, make sure to use plenty of flour so that it doesn’t stick to everything. It’s also important to refrigerate the assembled pies for at least an hour before baking them so that the dough is cold when you put it in the oven. Follow these simple steps and you’ll be rewarded with a delicate pastry, richly flavorful, and so flaky it may remind you of a croissant. The pastry cream in this recipe is simply a half batch of my standard, tried-and-true, turns-out-gorgeous-every-time, pastry cream. This lovely confection shows up in recipes all over this blog because it’s extremely easy to make, keeps for days in the refrigerator (you can even freeze it), is extremely versatile (add flavorings, lighten it with whipped cream), and absolutely delicious. 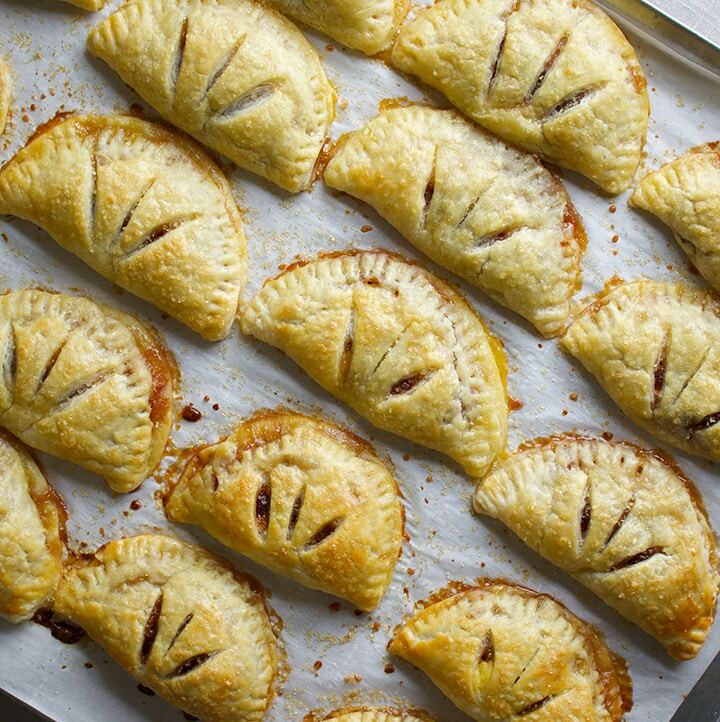 For these hand pies, I’ve used both vanilla and almond extract, but feel free to use only one or the other. 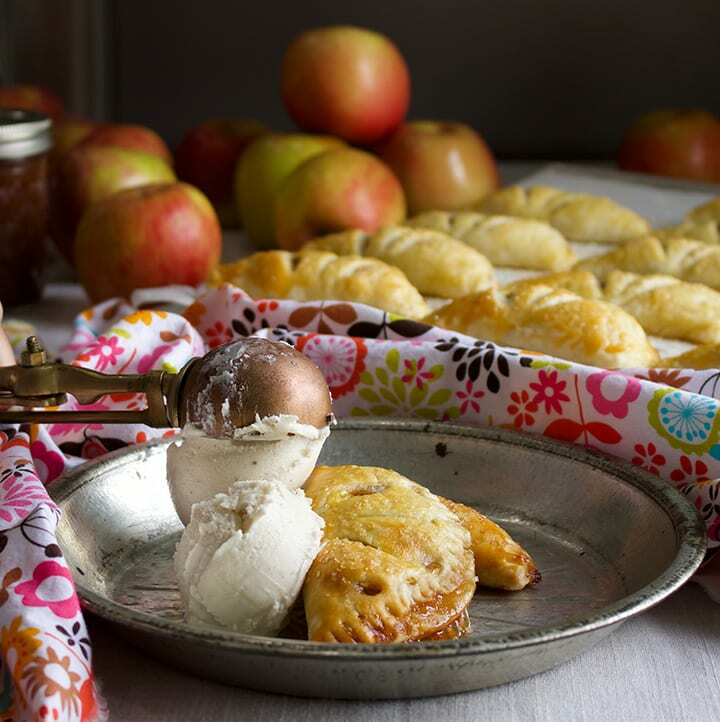 Paired with the crispy apple slice and spicy apple butter, the pastry cream is a deliciously creamy contrast or flavor. As I mentioned earlier, I got a bit obsessed with making apple butter this year. Partly because I forgot how much I love the stuff, and partly because I created a slow cooker recipe that requires NO coring and peeling of the apples. The entire process takes about 24 hours – apple butter must simmer at a low heat for a long time – BUT, only about 30 minutes of that is actually hands-on work. The rest of the time you’re just letting it do it’s thing while you get on with your life. Having said all that, homemade apple butter is not a requirement for these babies. 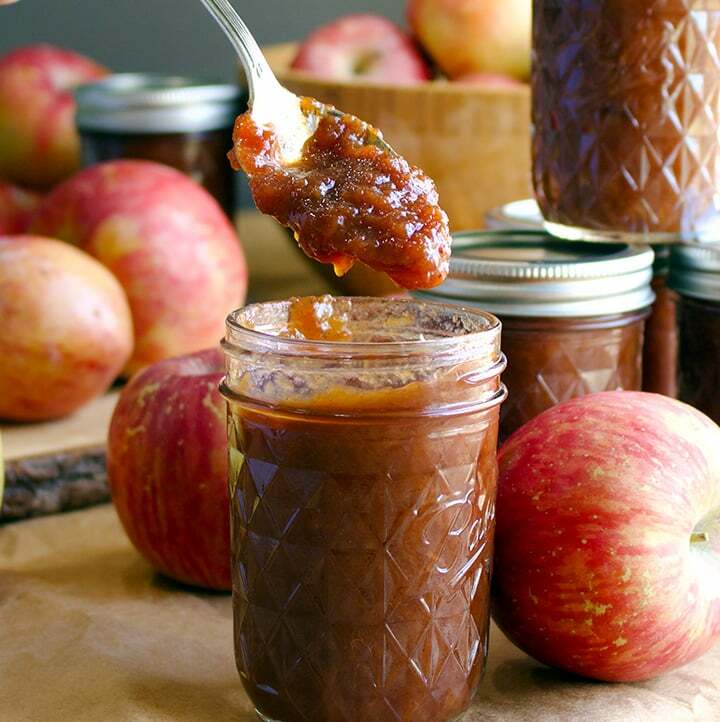 Pick up a jar of apple butter at your local market, or order some from Amazon. 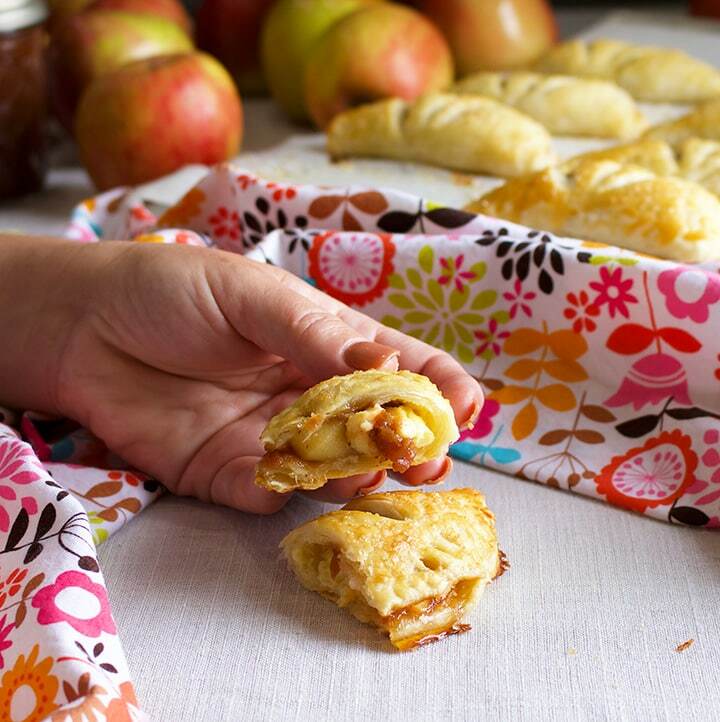 One of the greatest things about hand pies is that, obviously, they can be eaten with your hands, no plate and fork required. But, if you really want to step up your game, a scoop or two of vanilla ice cream and a drizzle of Salted Caramels Sauce or Caramel Rum Sauce is where it’s at. Add milk, sugar, salt, egg yolks and cornstarch to a medium size heavy bottomed saucepan and whisk vigorously to combine. Bring to a boil over medium heat, whisking constantly, at which point the mixture will have thickened to the point that the whisk will leave tracks as you stir. Remove from the heat and whisk vigorously for 30 seconds longer. Pour into a bowl. Break the gelatin into small pieces, dropping them into the hot pastry cream. Whisk until the gelatin is completely incorporated, about 20 seconds. Whisk in vanilla and almond extracts. Cover with plastic wrap, pressing the wrap over the surface of the pastry cream, and punch a few holes in the surface of the wrap with a sharp knife. Refrigerate for at least 3 hours and up to 24 hours. Add the sour cream, apple cider vinegar, and ice water to a measuring cup and stir to combine. Add the flour, salt, and sugar to the bowl of a food processor and pulse a couple of times to combine. Scatter the pieces of butter over the flour and pulse 5 or 6 times, until the mixture resembles coarse crumbs with a few pea sized pieces of butter scattered throughout. Pour the sour cream mixture into the bowl, and pulse just until the dough begins to come together. Dump the mixture into a large bowl and gently squeeze together with your hands just until it forms a cohesive dough; do not not overwork the dough. Wrap the dough tightly in plastic wrap and refrigerate for at least 1 hour and up to 2 days. Peel and core the apple and cut it into thin slices no more than a 1/4-inch thick. Put the apple slices in a bowl and toss with the teaspoon of lemon juice to prevent browning. Put about 2 tsp of pastry cream in the center of each circle of dough, spreading it out slightly but not getting it too close to the edges of the dough. Top the pastry cream with about 2 tsp of apple butter and 1 slice of apple. Fold the dough over the filling to form a half moon shape and press the edges together gently with your fingers. Lay the pie on the parchment covered baking sheet and press the edges together with the tongs of a fork to seal. Repeat with the remaining pies and dough, re-rolling the scraps of dough, until you have approximately 18-20 pies. Cover the pies loosely with plastic wrap and refrigerate for at least 1 hour, and up to 12 hours. In a small bowl, whisk together the egg and teaspoon of milk. Remove the pies from the refrigerator and use a sharp knife to cut three slits in the top crust of each pie. Using a pastry brush, coat the tops of the pies with the egg mixture. Sprinkle each generously with sugar. Bake the pies for 28-32 minutes, turning the sheet around in the oven about halfway through baking, until the crust is golden and you can see the filling bubbling through the slits in the pies. Remove from the oven and let cool for at least 10 minutes before serving. Store leftover pies in the refrigerator. 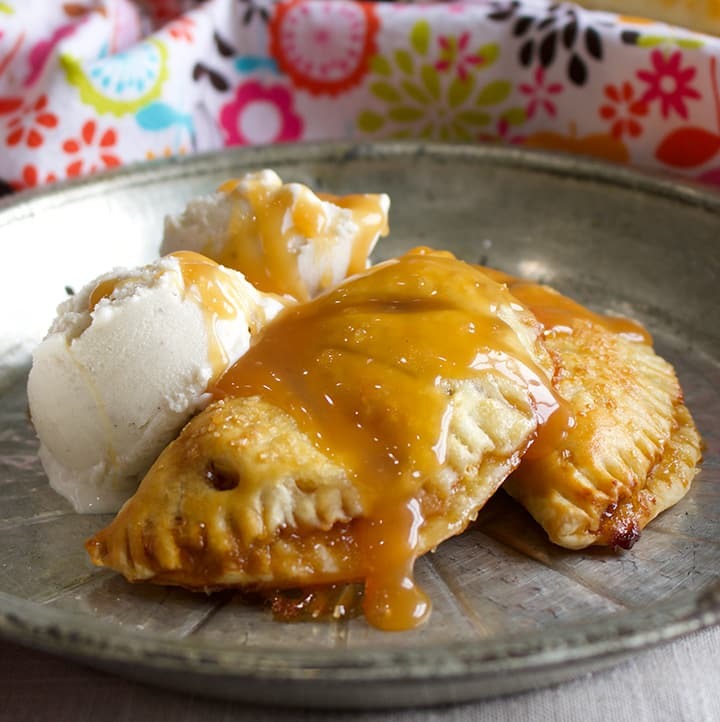 OPTIONAL: Serve with vanilla ice cream and a drizzle of caramel sauce or caramel rum sauce.